Two years ago the Duckbotics club went to Adkins high school in Austin to compete against other schools in the best of... competion. We fought hard for three rounds and came in eigth. We started in late August with the parts the best of... sponsors supplied to us. This is one of our two main drivers. He was trying to make a Wood axle. This is the playing field from the capital best competion of two years ago. 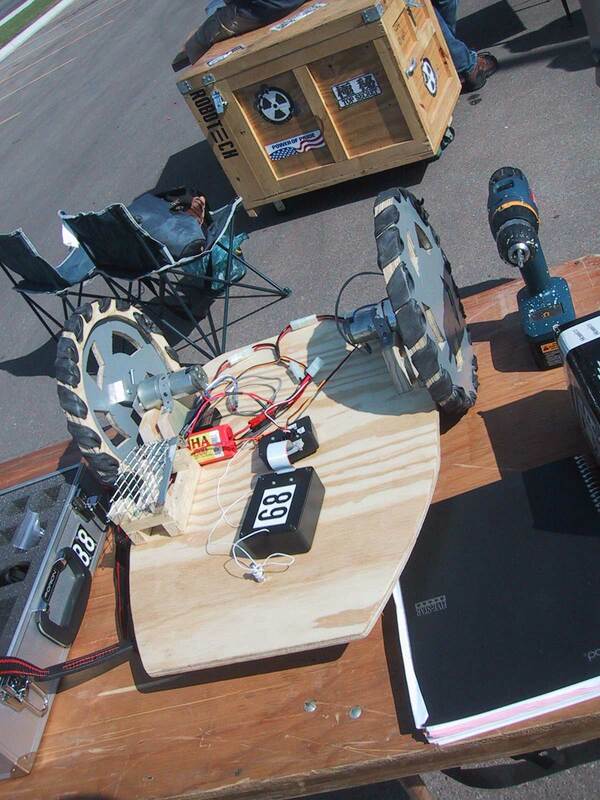 It was a lot hard then last years i think and it was a great challange for our first competion as a robotics club. I will never forget the hard work that was put in, because everyone knows that the first year is the worst. Our first battle turned out to be horrible. We got in tried for the bumble balls(which were worth 50 points), and didnt even make it to the side of the playing field with them. So we were all buissy brainstorming ideas to make this robot better that were fast and simple. 15 minutes turned out to be nowhere near what we needed. So we went back on hoping for a maracle. This is what is known as the Duckbotics Mascot. It started out as a little thing to do at pep-rallies and quickly came out to be the best part of the club. The duck also named as Mallard, is the first duck out of many. It has made apperances at local football games, on the news, in the paper. What next...We are in the process of coming up with a huge duck that has every thing from wings to a fog machine. This is one of our first designs for the Duckbotics Club logo. We later changed it to the full duck surrounded by Taylor Duckbotics. This is cindy and sarah at one of our meetings. They wouldnt stop just for a picture by there lonesome, so I had to get one of both of them.We are into our last part of the best competition and are upgrading for an assembly at the elemantary school. This is matt right before we had one of our many meetings. In that one we started to talk about a feild trip for robotics and jobs in everyday life, that have to deal with robotics. This is the competition area. It has four starting points and four holding bins. One for every team which is shown with there team color. The rest are arteries and capillaries that we have to take balloons from and put it in the designated spot. If by any chance your balloon pops you have to go and flip you designated switch. I think hardest part will be getting them into the cage rather than out. This is the robot after 2 weeks of planning and building. It had come together really well. Considering the time we got it put together. We had come up with around 5 ideas for the body and 3 for the balloon catcher. This is our robot after 3 weeks of building and designing. We decided to keep the arm off till later so that we can finish the modifications. We had to but the sleds on that morning and we missed our first few test runs. But over all we were ahead of where we were at the same time the year before. This is Mr. Downey in a Cobra that showed up to the Best of... practice day at Scott & White hospital in Temple. I was really surprised when the owner said we could all sit in it and take pictures. This is one cot the many different robots competing in the Best of ... We went up against them last year and they were awesome. I cant wait to drive with them again this year. This picture was taken on Mall Day. Our last of 2 practice days was held at North-cross mall in north Austin. It was a blast getting to the balloons and actually putting them in the basket where they go. 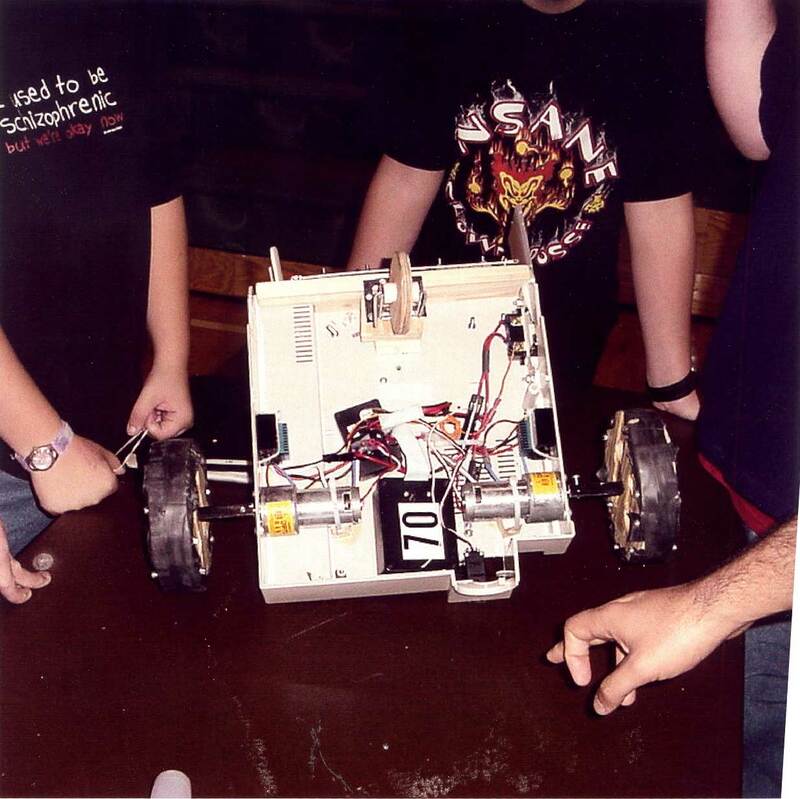 This was our first round and we soon found out that the wheels weren't attached well to the axles. This is the rest of the Team that showed up. I was the one behind the camera and from left to right we have Mr. Downey, Eric, Billy, Ryan, and Anthony. Billy is our 2nd driver and Anthony is our back up driver. This is the fighter 2 days before competition.. It was very hard to build but we made deadline by 2 DAYS. That is so great. Last year we were behind, now we are ahead. What a turn around! We will win. The night of weigh in, one day before competition. We were a little over, dimension wise but everything else checked in. We made a few last minute upgrades and we did hit the targeted range with only fifteen minutes of work. With the length of the nose we were out of the two foot range but we shrunk it down. It took a little work but it wasn't anything we wern't prepared to deal with. I was proud of the team after that quick fix. Whats that in the sky? Its a bird, Its a plane, No its super Downey. The check in was the worst part for everyone except the drivers. This is a robot from St. Patrick. 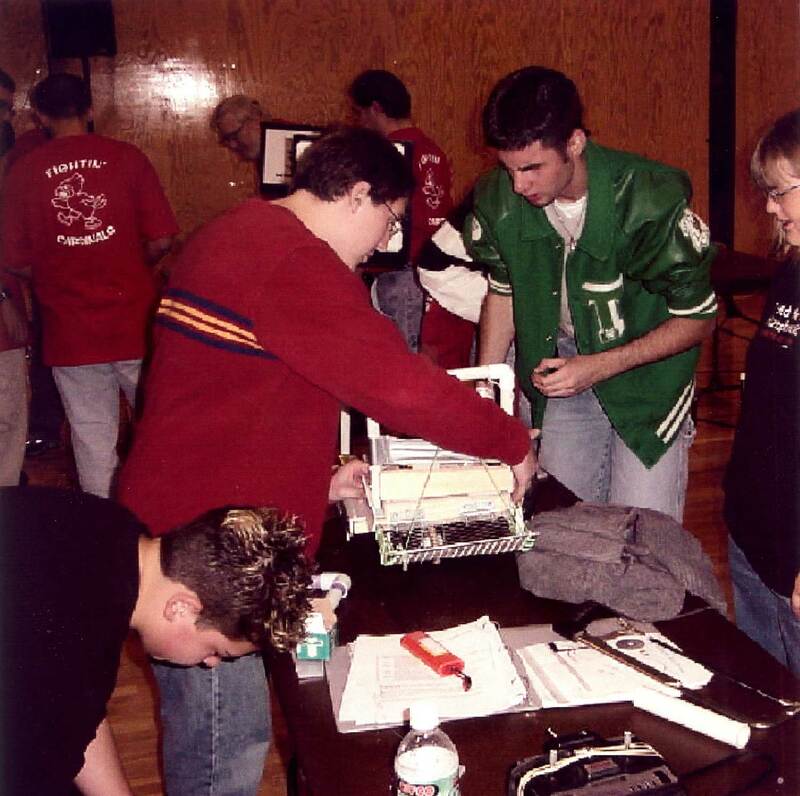 It had almost kicked us out of the semifinals, but at the last minute it couldnt get its balloon in to the box. That was a close call for use. We won that match by .17 points. This would be the competition area. It was around 20 feet long and 20 feet wide. The worst part was trying to comunicate across the field to the spotter. 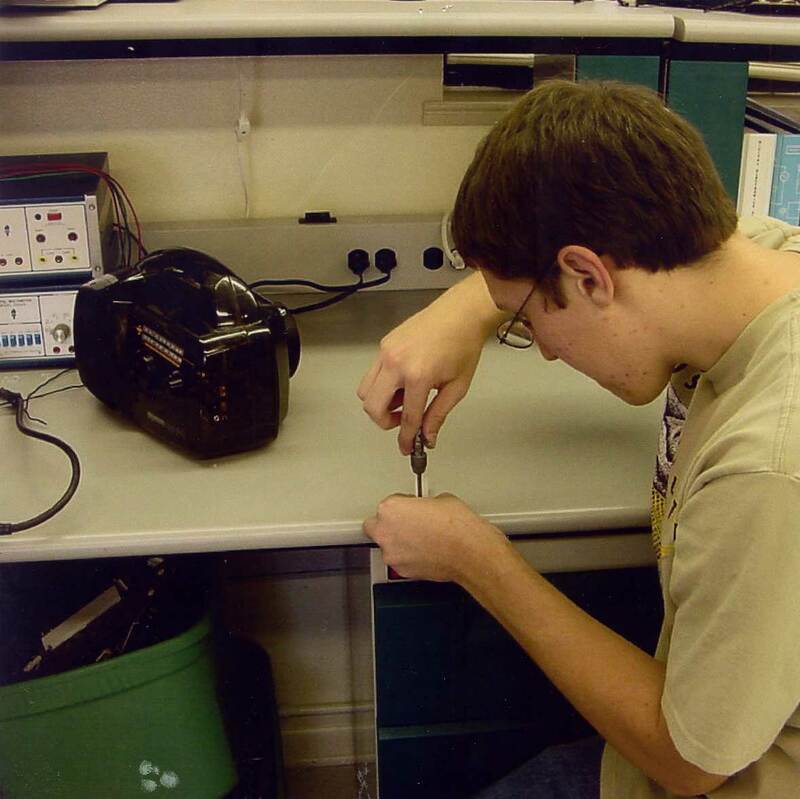 Next year we will be trying to buy a set of walkie talkies for robotics to use for better results. It was a great experiance in seeing that all the time we put in on the robot was for something good. This is me and william just before the first round. My nerves we on edge. 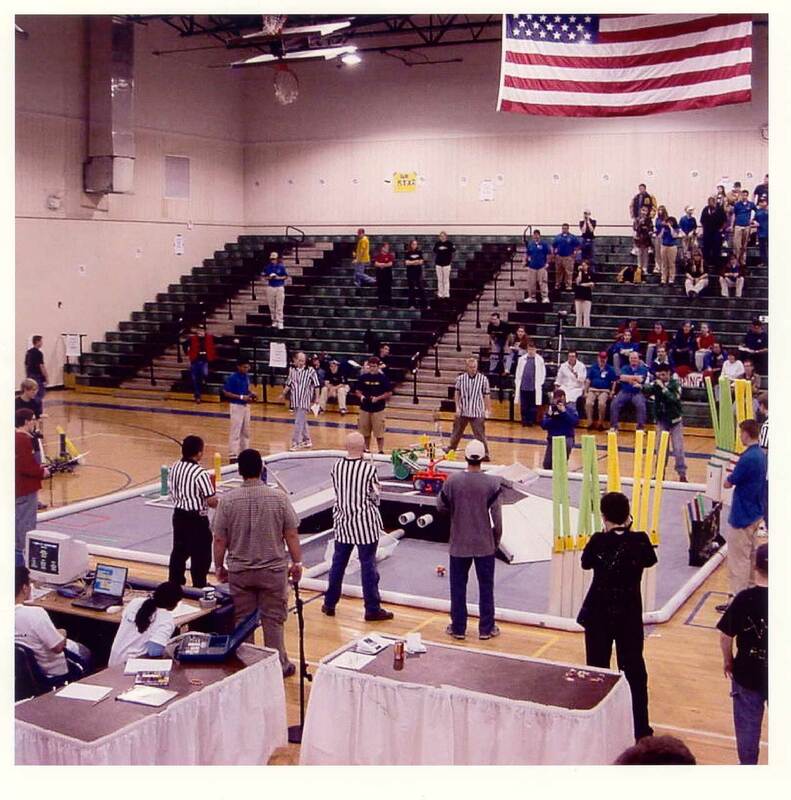 This was my first time in a head to head competition for robotics. I think this club has helped so much. I have learned a lot about electronics and the way they comunicate with computer "brains".